He said, however, that his intention was not to "coach" Iran on how to manage Trump's rejection of the deal. "What I have done is tried to elicit from him what Iran might be willing to do in order to change the dynamic in the Middle East for the better," Kerry explained. But, he shared his belief that the U.S., and the world at large, would be much better off if we had stayed in the agreement. So from my point of view, I think President Trump would have been much better advised to have kept the JCPOA, which would have kept China, Russia, France, Germany and Britain together with you, united. So you keep it in place, and you say to the Iranians, 'hey, guys, we’ve told you you’ve got to stop these other things. I’m going to give you two years or a year or whatever. We’re willing to negotiate on these other things. But if you don’t, if you haven’t done it by then, I’m out of this agreement.' And that way, you have China, Russia, these other countries with you in the effort to leverage this different behavior from Iran rather than unilaterally pulling out and isolating yourself and making it much more difficult to sit down with any Iranian. Kerry explained why the world is "safer" with JCPOA. So if we set up a structure in this agreement where if we suspected that some facility was being used, in other words, if Israel came to us or someone came to us and said we’ve got information that says this building is now being used for illicit activities to break out, we could say we want to inspect that building. And if they haven’t after those days allowed us to get in there in a span of time, which we could get in, in four days, in ten days, whatever it’s going to be, all the sanctions come back automatically. And we set up a structure where there’s no veto by the UN Security Council. Russia, China can’t, you know, veto our ability to do that. They’re automatically back. So we thought we had enormous amount of leverage. Moreover, if we are operating on really good intelligence, and we know what’s happening in that building, every single military option available to us today would have been available to us then. So we could bomb the facility. We could do whatever is necessary to guarantee that we hold them accountable. And finally, Hugh, I’ll just say to you, the fact is that when we started our negotiations, the breakout time to a nuclear weapon was about two months. Because of what we put in place, the breakout time is more than a year. So we have plenty of time to be able to make the decision that we need to make. And we thought that made Israel safer, made the region safer, made the world safer. In an interview with Fox News's Dana Perino Wednesday, Kerry did not deny that he was telling Iranians to "wait out" the president. "I think everybody in the world is sitting around talking about waiting out President Trump," Kerry said. Republican lawmakers are incensed by his admission, some accusing him of violating the Logan Act. 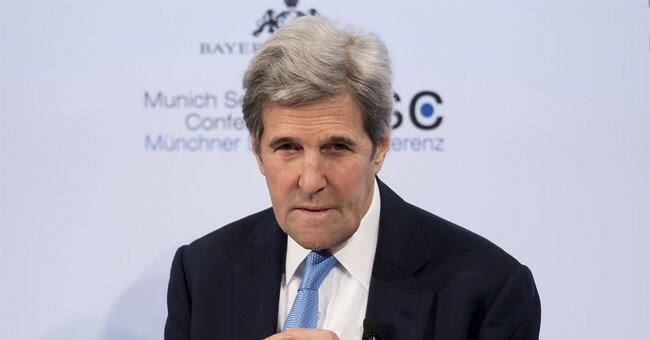 I assume MSM & Dems who got vapors & cried “Logan Act!” when 46 senators & I released letter defending Senate’s treaty power will accuse ?@JohnKerry? of Logan Act violation. Kerry also disagreed with the president on the efforts he's taken to curb the threat of a nuclear North Korea. Trump's summit with Kim Jong Un was premature, he said during his interview on "Benson & Harf" Tuesday night. "You’ve got to have a strategy, you’ve got to have more than just the glitzy meeting with the flags and so forth, and nice statements," he charged. "And clearly now, there is no clarity as to what has - what is denuclearization? What is the definition of it?"